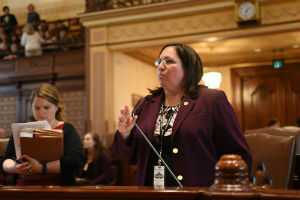 SPRINGFIELD– Senator Cristina Castro (D-Elgin) passed her measure in committee today which would allow Illinois consumers to have an added protection. Under Castro’s legislation, consumers would be protected from misleading practices, especially seniors and working families. The measure would make it an unlawful practice to offer consumers a rebate card that charges dormancy fees or other post-issuance fee. This measure was an initiative from the Illinois State Treasurer to prevent banks from taking unclaimed property on rebate cards. The State Treasurer and the Attorney General have worked together to protect Illinois consumers who have money owed to them from rebates. Senate Bill 222 passed the Commerce and Economic Development Committee and will now move to the Senate for a vote. SPRINGFIELD – While rates of maternal mortality are declining in other developed countries, the United States is experiencing a spike in deaths among pregnant and recently pregnant women and a wide and growing disparity among women based on their race and ethnicity. State Senators Toi Hutchinson (D-Chicago Heights) and Cristina Castro (D-Elgin) joined with advocates in Springfield this afternoon to discuss a comprehensive package of proposals to address the growing public health concern. Senator Castro has introduced a plan that would address the lack of services experienced by many new mothers. Senate Bill 1909 would create a pilot program to provide voluntary in-home nursing visits to low-income, first-time pregnant women; mandate quality control guidelines and hemorrhage protocols for birthing facilities; mandate insurance plans to cover medically necessary treatment for postpartum complications; and expand Medicaid coverage to continue for women during pregnancy and during the 12-month period post-birth. Hutchinson’s proposal, contained in Senate Bill 132, would require the state to add into continuing education requirements for doctors and nurses training on implicit bias, which is defined as the unconscious attitudes or stereotypes that can affect behaviors, decisions and actions in the treatment of women and minority groups. 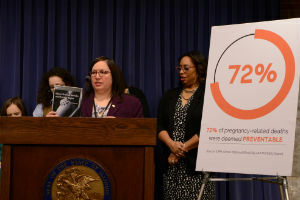 A study released by the Illinois Department of Public Health late last year found that non-Hispanic Black women are six times as likely to die of a pregnancy related condition as non-Hispanic White women. The study also found that Black women have the highest rate of severe maternal morbidity, three times higher than the rate for White women. Both Senate Bills 1909 and 132 were recently introduced in the Senate. Senate Bill 1909 has been assigned to the Senate Public Health Committee and Senate Bill 132 has been assigned to the Senate Licensed Activities Committee. 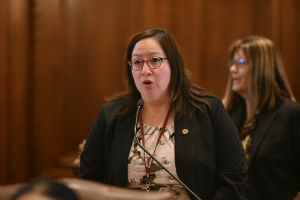 SPRINGFIELD – A measure to protect undocumented immigrant tenants from landlord harassment passed the Senate today thanks to Elgin Democrat State Senator Cristina Castro. Senate Bill 1290 creates the Immigrant Tenant Protection Act, which prohibits landlords from questioning a tenant’s immigration status as a means of harassment or to force an eviction. “We have to put a protection in place to ensure that landlords are not holding their tenants’ immigration status over their head to pressure higher rent or eviction,” said Castro. Castro’s measure would allow tenants to report criminal activity or habitability issues without being targeted based on their immigration status. Currently, the Illinois Human Rights Act does not protect individuals based on immigration status, nor does it place any limitations on when a landlord may request or share that information. Senate Bill 1290 passed the Senate today and now moves to the House for consideration. 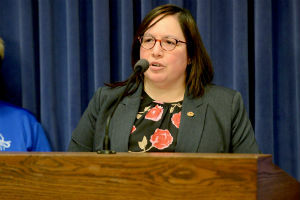 SPRINGFIELD – The State of Illinois currently does not have a limit on how many patients are assigned to registered nurses at one time, creating an unrealistic workload, but State Senator Cristina Castro (D-Elgin) is working to change that. Castro’s measure would create the Safe Patient Limits Act, setting a cap on how many patients can be assigned to a registered nurse in specified situations. This would allow Rn’s a lighter workload, which would give them more time with their assigned patients. Senate Bill 1908 has been assigned to the Senate Public Health Committee.